Named after the capital of Belgium, Brussels sprouts come from the cruciferous, or Brassica, family along with cabbage, broccoli, cauliflower, kale, kohlrabi, collards, mustard and bok choy. They provide high amounts of vitamin C, vitamin A, folic acid, potassium, selenium, iron and fiber. While the sprouts themselves look like mini cabbages, they grow on stalks with leaves on top. If you're lucky enough to be either growing them yourself or buying them at a farmer's market, you can use the stalks' leaves on their own. Some farmer's markets may even sell these greens individually. Remove the leaves from the Brussels sprouts stalks. Remove the Brussels sprouts and put them aside for later use. Discard the stalks. Clean the Brussels sprouts greens thoroughly. It’s best to do this just before you use them. Pull or cut the leaves away from the center rib, as you would do with kale. 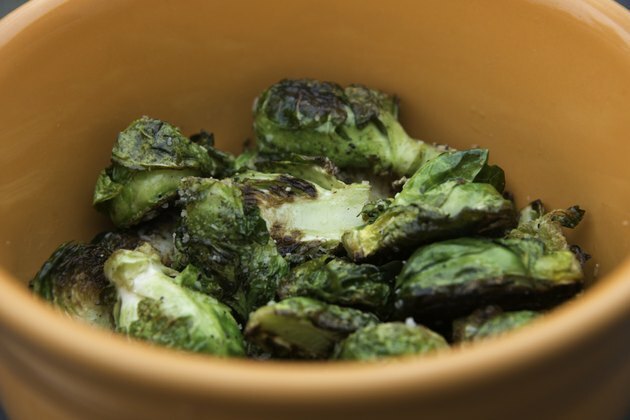 Chop the Brussels sprouts greens into small, edible-size pieces. Prepare the other ingredients you’ll be using. Mince two or more cloves of garlic. Dice shallots or red onions. Core and dice a sweet, juicy apple. Other options include raisins or dried cranberries. You can add nuts at the end of the cooking process. Heat up about 1 tbsp. olive oil in a sauté pan. Add the garlic, shallot or red onion, apple or whatever you choose to use, and cook at medium heat until lightly brown. For extra heat, add red pepper flakes. Add the Brussels sprouts leaves. Cover the pan and allow it to steam until leaves are tender, anywhere from 10 to 20 minutes. Stir frequently. Cut up some pecans or walnuts. Season your dish with salt and pepper and let it cook without the lid for a few more minutes. Before you serve it, add chopped pecans or walnuts. Another option is to cut 1/4 lb. pancetta or bacon and brown it in the sauté pan. Then, stir in your other ingredients and, finally, your greens. You can also braise the greens by adding chicken or vegetable broth and cooking, covered, for eight to 10 minutes. If possible, use younger leaves, which are more tender. Add 1 tsp. sugar if the greens are too bitter.